Squirrels are members of the family Sciuridae, a family that includes small or medium-size rodents. The squirrel family includes tree squirrels, ground squirrels, chipmunks, marmots (including woodchucks), flying squirrels, and prairie dogs amongst other rodents. Squirrels are indigenous to the Americas, Eurasia, and Africa, and were introduced by humans to Australia. The earliest known squirrels date from the Eocene period and are most closely related to the mountain beaver and to the dormouse among other living rodent families. The word "squirrel", first attested in 1327, comes from the Anglo-Norman esquirel which is from the Old French escurel, the reflex of a Latin word sciurus. This Latin word was borrowed from the Ancient Greek word σκίουρος, skiouros, which means shadow-tailed, referring to the bushy appendage possessed by many of its members. The native Old English word for the squirrel, ācweorna, survived only into Middle English (as aquerne) before being replaced. The Old English word is of Common Germanic origin, cognates of which are still used in other Germanic languages, including the German Eichhörnchen (diminutive of Eichhorn, which is not as frequently used), the Norwegian ikorn/ekorn, the Dutch eekhoorn, the Swedish ekorre and the Danish egern. Reaching out for food on a garden bird feeder, this squirrel can rotate its hind feet, allowing it to descend a tree head-first. Skull of an Oriental giant squirrel (genus Ratufa)—note the classic sciuromorphous shape of the anterior zygomatic region. Squirrels are generally small animals, ranging in size from the African pygmy squirrel at 7–10 cm (2.8–3.9 in) in length and just 10 g (0.35 oz) in weight, to the Laotian giant flying squirrel at 1.08 m (3 ft 7 in) in length and the Alpine marmot, which weighs from 5 to 8 kg (11 to 18 lb). Squirrels typically have slender bodies with bushy tails and large eyes. In general, their fur is soft and silky, though much thicker in some species than others. The coat color of squirrels is highly variable between—and often even within—species. In most squirrel species, the hind limbs are longer than the fore limbs, while all species have either four or five toes on each paw. The paws, which include an often poorly developed thumb, have soft pads on the undersides and versatile, sturdy claws for grasping and climbing. Tree squirrels, unlike most mammals, can descend a tree head-first. They do so by rotating their ankles 180 degrees, enabling the hind paws to point backward and thus grip the tree bark from the opposite direction. Squirrels live in almost every habitat, from tropical rainforest to semiarid desert, avoiding only the high polar regions and the driest of deserts. They are predominantly herbivorous, subsisting on seeds and nuts, but many will eat insects and even small vertebrates. As their large eyes indicate, squirrels have an excellent sense of vision, which is especially important for the tree-dwelling species. Many also have a good sense of touch, with vibrissae on their limbs as well as their heads. The teeth of sciurids follow the typical rodent pattern, with large incisors (for gnawing) that grow throughout life, and cheek teeth (for grinding) that are set back behind a wide gap, or diastema. The typical dental formula for sciurids is 1.0.1.31.0.1.3. Many juvenile squirrels die in the first year of life. Adult squirrels can have a lifespan of 5 to 10 years in the wild. Some can survive 10 to 20 years in captivity. Premature death may be caused when a nest falls from the tree, in which case the mother may abandon her young if their body temperature is not correct. Many such baby squirrels have been rescued and fostered by a professional wildlife rehabilitator until they could be safely returned to the wild, although the density of squirrel populations in many places and the constant care required by premature squirrels means that few rehabilitators are willing to spend their time doing this and such animals are routinely euthanized instead. Squirrels mate either once or twice a year and, following a gestation period of three to six weeks, give birth to a number of offspring that varies by species. The young are altricial, being born naked, toothless, and blind. In most species of squirrel, the female alone looks after the young, which are weaned at six to ten weeks and become sexually mature by the end of their first year. In general, the ground-dwelling squirrel species are social, often living in well-developed colonies, while the tree-dwelling species are more solitary. Ground squirrels and tree squirrels are usually either diurnal or crepuscular, while the flying squirrels tend to be nocturnal—except for lactating flying squirrels and their young, which have a period of diurnality during the summer. Because squirrels cannot digest cellulose, they must rely on foods rich in protein, carbohydrates, and fats. In temperate regions, early spring is the hardest time of year for squirrels because the nuts they buried are beginning to sprout (and thus are no longer available to eat), while many of the usual food sources have not yet become available. During these times, squirrels rely heavily on the buds of trees. Squirrels, being primarily herbivores, eat a wide variety of plants, as well as nuts, seeds, conifer cones, fruits, fungi, and green vegetation. Some squirrels, however, also consume meat, especially when faced with hunger. Squirrels have been known to eat small birds, young snakes, and smaller rodents, as well as bird eggs and insects. Indeed, some tropical squirrel species have shifted almost entirely to a diet of insects. Predatory behavior has been observed in various species of ground squirrels, in particular the thirteen-lined ground squirrel. For example, Bailey, a scientist in the 1920s, observed a thirteen-lined ground squirrel preying upon a young chicken. Wistrand reported seeing this same species eating a freshly killed snake. Whitaker examined the stomachs of 139 thirteen-lined ground squirrels and found bird flesh in four of the specimens and the remains of a short-tailed shrew in one; Bradley, examining the stomachs of white-tailed antelope squirrels, found at least 10% of his 609 specimens' stomachs contained some type of vertebrate, mostly lizards and rodents. Morgart observed a white-tailed antelope squirrel capturing and eating a silky pocket mouse. The living squirrels are divided into five subfamilies, with about 58 genera and some 285 species. The oldest squirrel fossil, Hesperopetes, dates back to the Chadronian (late Eocene, about 40–35 million years ago) and is similar to modern flying squirrels. A variety of fossil squirrels, from the latest Eocene to the Miocene, have not be assigned with certainty to any living lineage. At least some of these probably were variants of the oldest basal "protosquirrels" (in the sense that they lacked the full range of living squirrels' autapomorphies). The distribution and diversity of such ancient and ancestral forms suggest the squirrels as a group may have originated in North America. Apart from these sometimes little-known fossil forms, the phylogeny of the living squirrels is fairly straightforward. The three main lineages are the Ratufinae (Oriental giant squirrels), Sciurillinae and all other subfamilies. The Ratufinae contain a mere handful of living species in tropical Asia. The neotropical pygmy squirrel of tropical South America is the sole living member of the Sciurillinae. The third lineage, by far the largest, has a near-cosmopolitan distribution. This further supports the hypothesis that the common ancestor of all squirrels, living and fossil, lived in North America, as these three most ancient lineages seem to have radiated from there; if squirrels had originated in Eurasia, for example, one would expect quite ancient lineages in Africa, but African squirrels seem to be of more recent origin. The main group of squirrels also can be split into three subgroups, which yield the remaining subfamilies. The Sciurinae contains the flying squirrels (Pteromyini) and the Sciurini, which among others contains the American tree squirrels; the former have often been considered a separate subfamily, but are now seen as a tribe of the Sciurinae. The pine squirrels (Tamiasciurus), on the other hand, are usually included with the main tree squirrel lineage, but appear to be about as distinct as the flying squirrels; hence, they are sometimes considered a distinct tribe, Tamiasciurini. Two of the three subfamilies are of about equal size, containing between nearly 70 and 80 species each; the third is about twice as large. The Sciurinae contains arboreal (tree-living) squirrels, mainly of the Americas and to a lesser extent Eurasia. The Callosciurinae is most diverse in tropical Asia and contains squirrels that are also arboreal, but have a markedly different habitus and appear more "elegant", an effect enhanced by their often very colorful fur. 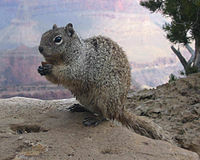 The Xerinae—the largest subfamily—are made up from the mainly terrestrial (ground-living) forms and include the large marmots and the popular prairie dogs, among others, as well as the tree squirrels of Africa; they tend to be more gregarious than other squirrels, which do not usually live together in close-knit groups. ^ Seebeck, J. H. "Sciuridae" (PDF). Fauna of Australia. Archived from the original (PDF) on 17 January 2015. Retrieved 24 November 2013. ^ "squirrel, n.". The Oxford English Dictionary (2nd. ed.). Oxford University Press. 1989. Retrieved 8 November 2010. ^ "Squirrel". Online Etymology Dictionary. Retrieved 7 February 2008. ^ Tree Squirrels, Wildlife Online, 23 November 2010. ^ "Rodents". 22 April 2008. Retrieved 30 December 2016. ^ Thorington, Richard W.; Koprowski, John L.; Steele, Michael A.; Whatton, James F. (2012). Squirrels of the World. Johns Hopkins University Press. p. 8. ISBN 978-1421404691. ^ a b Squirrel Place Archived 27 December 2010 at the Wayback Machine. squirrels.org. Retrieved 14 December 2010. ^ Thorington, Richard W.; Koprowski, John L.; Steele, Michael A.; Whatton, James F. (2012). Squirrels of the World. Johns Hopkins University Press. p. 12. ISBN 978-1421404691. ^ "Squirrel Rehab". Retrieved 19 August 2017. ^ "Red & Gray Squirrels in Massachusetts". MassWildlife. Massachusetts Division of Fisheries and Wildlife. Archived from the original on 17 May 2013. Retrieved 3 April 2012. ^ Törmälä, Timo; Vuorinen, Hannu; Hokkanen, Heikki (1980). "Timing of circadian activity in the flying squirrel in central Finland". Acta Theriologica. 25 (32–42): 461–474. doi:10.4098/at.arch.80-42. Archived from the original on 27 September 2007. Retrieved 11 July 2007. ^ "Russian squirrel pack 'kills dog'". bbc.co.uk. 1 December 2005. Retrieved 13 July 2018. ^ Richard W. Thorington, Katie Ferrell – Squirrels: the animal answer guide, JHU Press, 2006, ISBN 0-8018-8402-0, ISBN 978-0-8018-8402-3, p. 75. ^ Friggens, M. (2002). "Carnivory on Desert Cottontails by Texas Antelope Ground Squirrels". The Southwestern Naturalist. 47 (1): 132–133. doi:10.2307/3672818. JSTOR 3672818. ^ Bailey, B. (1923). "Meat-eating propensities of some rodents of Minnesota". Journal of Mammalogy. 4 (2): 129. doi:10.1093/jmammal/4.2.129. ^ Wistrand, E.H. (1972). "Predation on a Snake by Spermophilus tridecemlineatus". American Midland Naturalist. 88 (2): 511–512. doi:10.2307/2424389. JSTOR 2424389. ^ Whitaker, J.O. (1972). "Food and external parasites of Spermophilus tridecemlineatus in Vigo County, Indiana". Journal of Mammalogy. 53 (3): 644–648. doi:10.2307/1379067. JSTOR 1379067. ^ Bradley, W. G. (1968). "Food habits of the antelope ground squirrel in southern Nevada". Journal of Mammalogy. 49 (1): 14–21. doi:10.2307/1377723. JSTOR 1377723. ^ Morgart, J. R. (May 1985). "Carnivorous behavior by a white-tailed antelope ground squirrel Ammospermophilus leucurus". The Southwestern Naturalist. 30 (2): 304–305. doi:10.2307/3670745. JSTOR 3670745. ^ Wilson, D.E. ; Reeder, D.M. (2011). "Class Mammalia Linnaeus, 1758. In: Zhang, Z.-Q. (Ed.) Animal biodiversity: An outline of higher-level classification and survey of taxonomic richness" (PDF). Zootaxa. 3148: 56–60. ^ Emry, R. J.; Korth, W. W. (2007). "A new genus of squirrel (Rodentia, Sciuridae) from the mid-Cenozoic of North America". Journal of Vertebrate Paleontology. 27 (3): 693–698. doi:10.1671/0272-4634(2007)27[693:ANGOSR]2.0.CO;2. Steppan, S. J.; Storz, B. L.; Hoffmann, R. S. (2004). "Nuclear DNA phylogeny of the squirrels (Mammalia: Rodentia) and the evolution of arboreality from c-myc and RAG1". Molecular Phylogenetics and Evolution. 30 (3): 703–719. doi:10.1016/S1055-7903(03)00204-5. PMID 15012949. The American red squirrel (Tamiasciurus hudsonicus) is one of three species of tree squirrels currently classified in the genus Tamiasciurus, known as the pine squirrels (the others are the Douglas squirrel, T. douglasii, and Mearns's squirrel, T. mearnsi). The American red squirrel is variously known as the pine squirrel, North American red squirrel and chickaree. It is also referred to as Hudson's Bay Squirrel, as in John James Audubon's work The Viviparous Quadrupeds of North America (hence the species name). The squirrel is a small, 200–250 g (7.1–8.8 oz), diurnal mammal that defends a year-round exclusive territory. It feeds primarily on the seeds of conifer cones, and is widely distributed across North America wherever conifers are common, except on the Pacific coast, where its cousin, the Douglas squirrel, is found instead. The American red squirrel is not found on most of the Great Plains or in the southeastern United States, as conifer trees are not common in those areas. Recently, the squirrel has been expanding its range into hardwood forests. The Arctic ground squirrel (Urocitellus parryii) (Inuktitut: ᓯᒃᓯᒃ, siksik) is a species of ground squirrel native to the Arctic. People in Alaska, particularly around the Aleutians, refer to them as "parka" squirrels, most likely because their pelt is good for the ruff on parkas and for clothing. The black squirrel occurs as a melanistic subgroup of both the eastern gray squirrel and the fox squirrel. Their habitat extends throughout the Midwestern United States, in some areas of the Northeastern United States, eastern Canada, and also in the United Kingdom. The overall population of black squirrels is small when compared to that of the gray squirrel. The rarity of the black squirrel has caused many people to admire them, and the black squirrels enjoy great affection in some places as mascots. The bobak marmot (Marmota bobak), also known as the steppe marmot, is a species of marmot that inhabits the steppes of Eastern Europe and Central Asia. It is a social animal and inhabits steppe grassland, including cultivated field borders. It hibernates for more than half the year. Litter sizes average about five offspring and it takes three years for the young marmots to reach sexual maturity. Male offspring leave the home colony after their second winter, and about 60% of mature females give birth in any one year. The fur is used to make hats and coats and a Moscow fur-farm is experimenting with breeding bobak marmots for their pelts. The California ground squirrel (Otospermophilus beecheyi), also known as the Beechey ground squirrel, is a common and easily observed ground squirrel of the western United States and the Baja California Peninsula; it is common in Oregon and California and its range has relatively recently extended into Washington and northwestern Nevada. Formerly placed in Spermophilus, as Spermophilus beecheyi, it was reclassified in Otospermophilus in 2009 as it became clear that Spermophilus as previously defined was not a natural (monophyletic) group. A full species account was published for this species in 2016. Chipmunks are small, striped rodents of the family Sciuridae. Chipmunks are found in North America, with the exception of the Siberian chipmunk which is found primarily in Asia. Sciurus carolinensis, common name eastern gray squirrel or grey squirrel depending on region, is a tree squirrel in the genus Sciurus. It is native to eastern North America, where it is the most prodigious and ecologically essential natural forest regenerator. Widely introduced to certain places around the world, the eastern gray squirrel in Europe, in particular, is regarded as an invasive species. Flying squirrels (scientifically known as Pteromyini or Petauristini) are a tribe of 50 species of squirrels in the family Sciuridae. They are not capable of flight in the same way as birds or bats but are able to glide from one tree to another with the aid of a patagium, a furry, parachute-like membrane that stretches from wrist to ankle. Their long tail provides stability in flight. Anatomically they are very similar to other squirrels but have a number of adaptations to suit their life style; their limb bones are longer and their hand, foot bones and distal vertebrae are shorter. Flying squirrels are able to steer and exert control over their glide path with their limbs and tail. Molecular studies have shown that flying squirrels are monophyletic and originated some 18–20 million years ago. Most are nocturnal and omnivorous, eating fruit, seeds, buds, flowers, insects, gastropods, spiders, fungi, bird's eggs and tree sap. The young are born in a nest and are at first naked and helpless. They are cared for by their mother and by five weeks are able to practice gliding skills so that by ten weeks they are ready to leave the nest. Some captive-bred southern flying squirrels have become domesticated as small household pets, a type of "pocket pet". 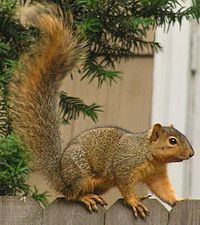 The fox squirrel (Sciurus niger), also known as the eastern fox squirrel or Bryant's fox squirrel, is the largest species of tree squirrel native to North America. Despite the differences in size and coloration, they are sometimes mistaken for American red squirrels or eastern gray squirrels in areas where the species co-exist. The ground squirrels are members of the squirrel family of rodents (Sciuridae) which generally live on or in the ground, rather than trees. The term is most often used for the medium-sized ground squirrels, as the larger ones are more commonly known as marmots (genus Marmota) or prairie dogs, while the smaller and less bushy-tailed ground squirrels tend to be known as chipmunks. Together, they make up the "marmot tribe" of squirrels, Marmotini, and the large and mainly ground squirrel subfamily Xerinae, and containing six living genera. Well-known members of this largely Holarctic group are the marmots (Marmota), including the American groundhog, the chipmunks, the susliks (Spermophilus), and the prairie dogs (Cynomys). They are highly variable in size and habitus, but most are remarkably able to rise up on their hind legs and stand fully erect comfortably for prolonged periods. They also tend to be far more gregarious than other squirrels, and many live in colonies with complex social structures. Most Marmotini are rather short-tailed and large squirrels, and the alpine marmot (Marmota marmota) is the largest living member of the Sciuridae, at 53–73 cm in length and weighing 5–8 kg. The chipmunks of the genus Tamias frequently spend time in trees. Also closer to typical squirrels in other aspects, they are occasionally considered a tribe of their own (Tamiini).The ground squirrel is especially renowned for its tendency to rise up on its hind legs. It does this whenever it senses nearby danger, or when it must see over tall grasses. The squirrel then curls its paws flat against its chest and sends a screeching call to warn other family members about the presence of predators. The least chipmunk (Neotamias minimus) is the smallest species of chipmunk and the most widespread in North America. Prairie dogs (genus Cynomys) are herbivorous burrowing rodents native to the grasslands of North America. The five species are: black-tailed, white-tailed, Gunnison's, Utah, and Mexican prairie dogs. They are a type of ground squirrel, found in the United States, Canadian Prairies and Mexico. In Mexico, prairie dogs are found primarily in the northern states, which lie at the southern end of the Great Plains: northeastern Sonora, north and northeastern Chihuahua, northern Coahuila, northern Nuevo León, and northern Tamaulipas. In the United States, they range primarily to the west of the Mississippi River, though they have also been introduced in a few eastern locales. Despite the name, they are not actually canines. The red squirrel or Eurasian red squirrel (Sciurus vulgaris) is a species of tree squirrel in the genus Sciurus common throughout Eurasia. The red squirrel is an arboreal, omnivorous rodent. In Great Britain, Ireland, and in Italy numbers have decreased drastically in recent years. This decline is associated with the introduction by humans of the eastern grey squirrel (Sciurus carolinensis) from North America. However, the population in Scotland is stabilising due to conservation efforts, awareness and the increasing population of the pine marten, a European predator that selectively controls grey squirrels. Squirrel Girl (Doreen Green) is a fictional superhero appearing in American comic books published by Marvel Comics. Her first appearance was in Marvel Super-Heroes vol. 2, #8, a.k.a. Marvel Super-Heroes Winter Special (cover-dated Winter 1991), in a story plotted and drawn by Steve Ditko and scripted by writer Will Murray. Her ability to communicate with squirrels is surprisingly effective and has allowed her to defeat major supervillains. She joined the Great Lakes Avengers, but left to move to New York City, where she served as nanny to Danielle Cage, the daughter of Luke Cage and Jessica Jones. In her solo series, the character splits her time between studying computer science at Empire State University, and fighting crime both solo and as a member of the Avengers. Murray desired to write a lighthearted superhero story as opposed to the often heavily dramatic tales that were the norm in mainstream comics at the time, which gave rise to his creation of Squirrel Girl. Squirrel monkeys are New World monkeys of the genus Saimiri. Saimiri is the only genus in the subfamily Saimirinae. The name of the genus is of Tupi origin (sai-mirim or gai-mbirin < sai 'monkey' and mirim 'small') and was also used as an English name by early researchers.Squirrel monkeys live in the tropical forests of Central and South America in the canopy layer. Most species have parapatric or allopatric ranges in the Amazon, while S. oerstedii is found disjunctly in Costa Rica and Panama. The common squirrel monkey is captured for the pet trade and for medical research but it is not threatened. Two squirrel monkey species are threatened: the Central American squirrel monkey and the black squirrel monkey are listed as vulnerable by the IUCN. Tree squirrels are the members of the squirrel family (Sciuridae) commonly just referred to as "squirrels". They include over a hundred arboreal species native to all continents except Antarctica and Oceania. They do not form a single natural, or monophyletic group; they are related to others in the squirrel family, including ground squirrels, flying squirrels, marmots, and chipmunks. The defining characteristic used to determine which species of Sciuridae are tree squirrels is dependent on their habitat rather than their physiology. Tree squirrels live mostly among trees, as opposed to those that live in burrows in the ground or among rocks. An exception is the flying squirrel that also makes its home in trees, but has a physiological distinction separating it from its tree squirrel cousins: special flaps of skin called patagia, acting as glider wings, which allows gliding flight. The best known genus of tree squirrels is Sciurus, which includes the Eastern gray squirrel of North America (introduced to Great Britain in 1876), the red squirrel of Eurasia, and the North American fox squirrel, among many others. Many tree squirrel species have adapted to human-altered environments such as rural farms, suburban backyards and urban parks; and because they are diurnal (active during the daytime) they have become perhaps the most familiar wildlife to most humans.